Hillside Commons is the only SUNY Oneonta housing option that will exceed all your expectations about student apartment living, and it all starts by picking the floor plan that is perfect for you! Browse our options for luxury two and three-bedroom apartments to find the style that will make you wish your room at home was this nice. 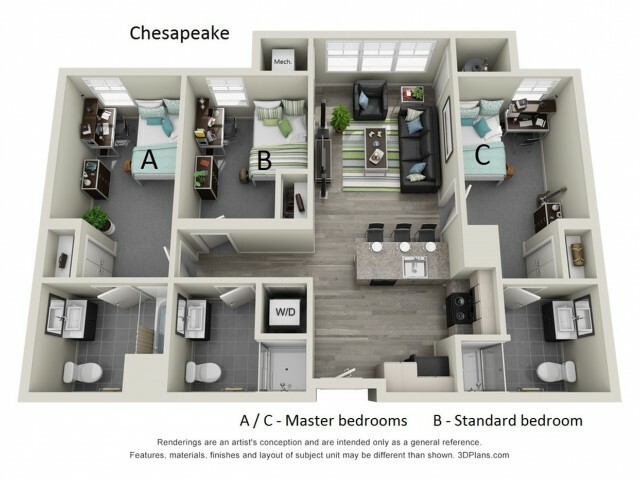 Each floor plan was created with your comfort in mind, so you will love your new home no matter which style you choose. Our Two and Three-bedroom apartments make the perfect home for students and recent graduates who value quality living in an environment that makes it easy to balance your social and private lives. Rent with a friend or let our roommate matching service choose the perfect roommate for you, either way you will have plenty of space for yourself and anything you choose to bring with you. Our apartment and community amenities complete the experience. Each of our units has a full sized washer/dryer, spacious closets, fully equipped kitchens with stainless steel appliances, central air conditioning, electronic locks, fully furnished apartments, and individual online leasing so renting an apartment has never been easier! See it all for yourself by viewing our photo gallery or contacting us to set up a personal tour. ***square feet listed is an approximate value for each floor plan.